TRAIN: Nearest station is Lermoos, with direct trains to Munich. 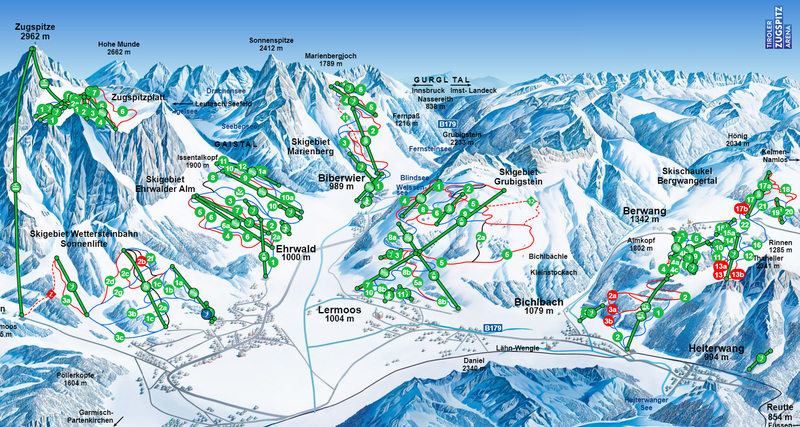 SKI FACTS: Lermoos is one of nine ski areas in the Zugspitz Arena. Lermoos is based in the Tirol Zugspitz Arena along with six other towns. 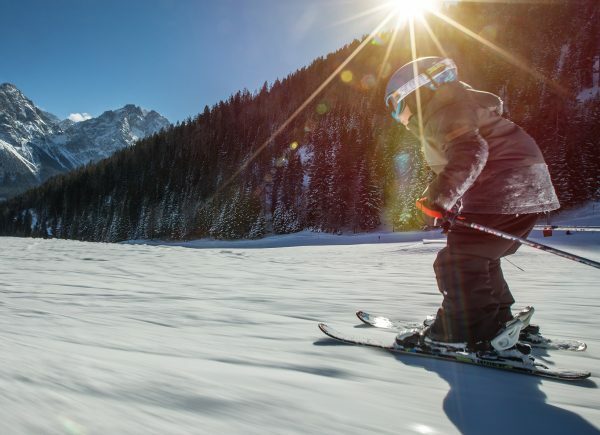 The sportier and busier towns are Lermoos, Ehrwald and Biberwier, whilst a quieter experience can be had in Berwang, Bichlbach, Heiterwang am See and Namlos. Lermoos is a good sized village with a great selection of hotels, shops and restaurants. The surrounding landscape is quite unique, with a large expanse of flat land that sits in the middle of the various villages creating an effect of the whole area being an arena, which seems to exaggerate the magnificence of the rising Zugspitz, Sonnenspitze and various local mountains. 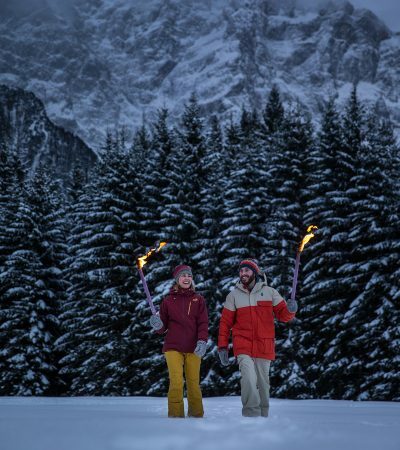 There is a great selection of activities outside of skiing and snowboarding, for instance there are 100 kms of cross-country ski trails, 60 kms of winter hiking trails. 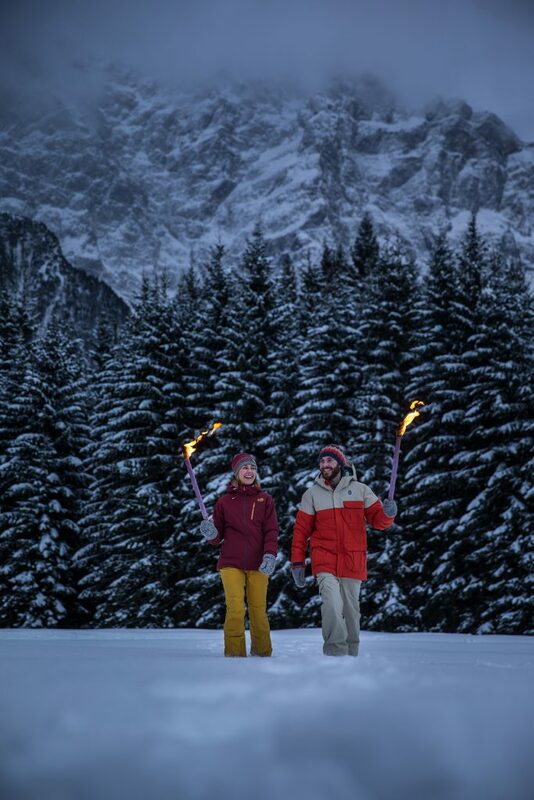 New for 2018 is the Igloo building workshop in the beautiful forests of Lermoos every Wednesday. If you are looking for some fun activities at night, the sledding at Gamsalm on a Wednesday evening is a must. 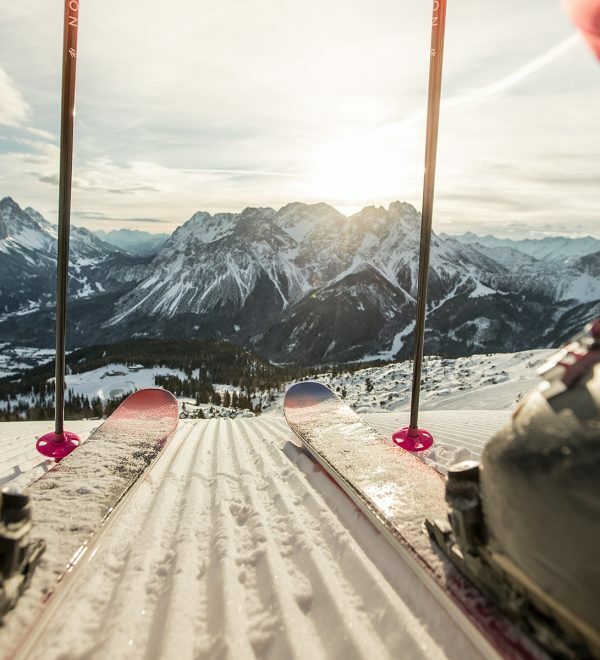 It starts with a hike up to Gamsalm where one has a fabulous Tyrolean dinner accompanied with live music and then one hops on a toboggan and flies down the pistes to the bottom of the valley. This certainly is a rush, and should not be missed. There are other Sledding opportunities around the valley on other nights too. There are many great restaurants in the area such as Roter Stein in Bichbachle, we can also recommend the Hotel Post especially for the spa and the cuisine. Lermoos is one of seven ski area in the Zugspitz arena, with 139 kilometres of pistes and 58 mountain railways and cable cars in the whole area. The whole Arena is connected by a free bus system with a valid guest card or ski pass. Every Thursday morning, one can pre-book First Track where the resort opens the lift system up at 7:30am for some pre-breakfast skiing with a guide from Snowpower ski school. 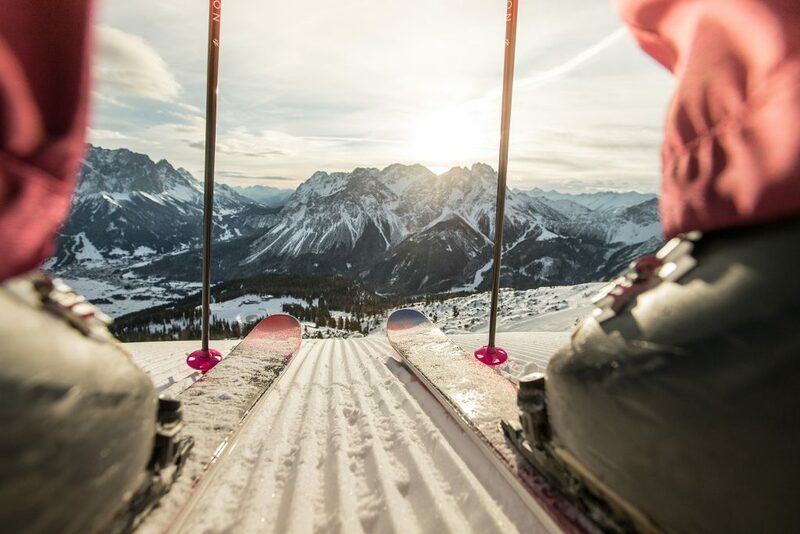 This makes for some spectacular views as the sun comes up over the Zugspitz, and having untouched slopes to oneself is a great way to start the day. A hearty Alpine breakfast is then served in the Wolfratshauser Huette setting you up for a long day of skiing. There are a selection of great blue pistes all over the mountain. The blues at the bottom of the mountain are a little easier. Once you find your ski legs, the blue piste number 8 is a lovely long piste that should be experienced. For intermediates, the whole mountain will be your playground, Piste 5 is a long and rather fun piste which winds its way down the mountain. There may only be three black pistes, but the many reds pistes provide some steeper action at certain points. When the conditions permit, there are some great looking steep pitches to ski. Many of the off piste areas are north facing which makes for some good conditions at times. As usual take a mountain guide to keep safe and find the best places to freeride. Lermoos Grubigstein has a fantastic selection of pistes that will generally please most people. I particularly liked the shape of the mountain and the way the pistes wind their way through various trees and geological shapes similar to the ancient ‘Gipslöcher’ Gypsum holes and mounds in Lech, which create fabulous rollers, twists and turns. The resort has a good variation of skiing above and below the tree line which make for varied terrain. When it comes to food on the mountain, lunch at Grubighutte the highest restaurant on the mountain is good and as mentioned the Wolfratshauser Huette makes for a wonderful location off the beaten track. Apres ski drinks in the little round hut belonging to Brettlalm at Gschwandtkreuz is super cosy and worth stopping by for one or two… or three! 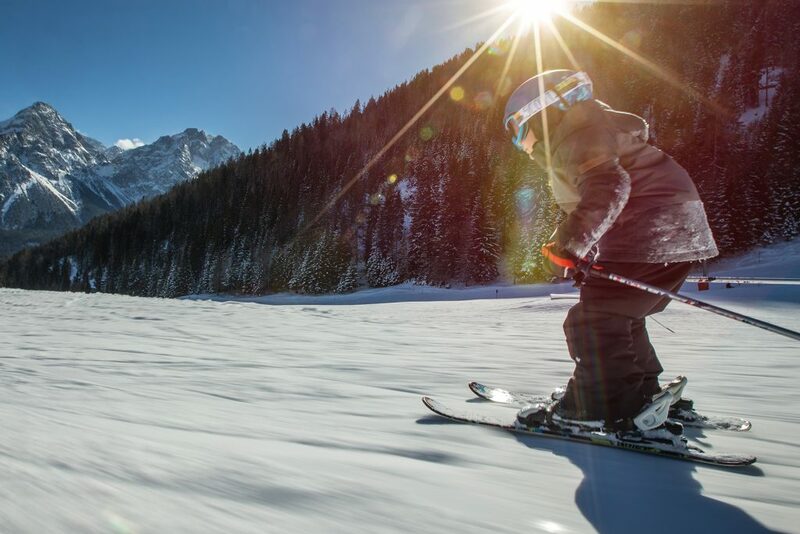 When visiting the Zugspitze Arena, there are obviously other areas to ski, but it is definitely worth taking the time if the weather permits to head up the Zugspitze, Germany’s highest mountain at 2962 metres (Oh if only it was 38cm bigger!). The views are absolutely stunning in every direction, one can even see Munich on a good day. 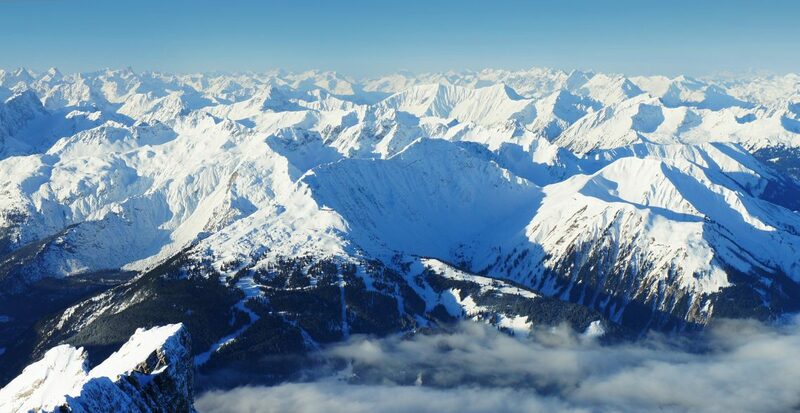 The engineering that has taken place over the years to reach this summit are breathtaking, from the early days of 1926 to the 2017 opening of the new Seilbahn Zugspitze cable car. The glacial skiing up at Zugspitzplatt looked pretty good as well, a perfect reason to return one day.